Kat Simons: TAMING HER TIGER -- Now Available! TAMING HER TIGER -- Now Available! The next installment of the Tiger Shifters series is here!! 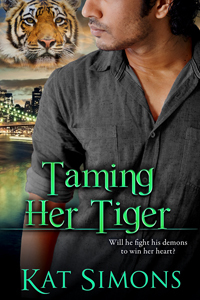 TAMING HER TIGER (Tiger Shifters 9) is Ethan Gupta (Tatiana's brother from Her Tiger To Take) and his "human" heroine Amy Donovan's story. The limited-time release price of $0.99 is available for two weeks after the release date only! Then the book will go up to its regular price of $4.99. So now is the time to pick this one up! Artist Amy Donovan never believed in muses—until one walked into her studio, bringing her art to life and setting her body alight with desire. Ethan Gupta is so mesmerizing, Amy can sense him before she sees him. But she’s too pragmatic, and too world-weary after the death of her parents, to imagine the gorgeous life model might have any interest in her. She has too much to do, and a younger sister to look after, to waste time pining for a man out of her reach. After having his heart shattered two years earlier, tiger shifter Ethan Gupta has abandoned his people to live in the human world. Then he walks into an art studio and catches Amy’s scent. He’s drawn to her in a way that rocks his world and turns his life upside down. His inner torment intensifies with the knowledge that she wants him, too. He refuses to risk his heart and soul again, but despite his best effort, he can’t stay away from her. When he discovers she’s being stalked by another tiger shifter, Ethan grabs the excuse to spend more time with her. But learning the identity of the stalker, and the reason he’s after Amy, changes everything. Because Amy is more than just a human woman. And the reality of her true nature will put her forever out of Ethan’s reach…unless he faces his inner demons and returns to the world he abandoned to fight for her. For regular readers of the series, I've decided to start sending newsletter subscribers some cut scenes from previous books, just for fun. If you haven't joined my newsletter and would like to receive the bonus reading material (including a short story that's available only to newsletter subscribers), sign up now! I'll start sending out the occasional cut scene this summer.